This cake, oh man, did it turn out well! What started out as a plain, but exceptionally good, pumpkin cake morphed into a gigantic cinnamon roll. The cake is fine textured and velvety smooth. It just melts in your mouth. As if that weren’t enough before baking it I swirled some cinnamon roll filling into the top which got all gooey and caramelized as it baked. Once out of the oven and still warm, I finished it off with a buttery cinnamon glaze that creeps into all the crevices, making this the best darn cake if I do say so myself. This would be fabulous for Christmas morning, or an addition to a holiday buffet or brunch, but it can certainly hold its own as an after dinner dessert as well. The cake recipe is one that I use often, it’s my favorite pumpkin cake. You could bake it in the form of cupcakes, a loaf cake, or whatever. You won’t be sorry with this cake recipe. I particularly like that it makes a small cake, perfect for two or a small family. Double all ingredients if you want to go bigger, it can handle it! 1. Preheat oven to 350*F. Grease or spray an 8 or 9-inch round cake pan and line the bottom with parchment paper. Set aside. 2. In a medium bowl whisk together the flour, baking powder, baking soda, salt and spices. 3. In the bowl of an electric mixer, beat the eggs and brown sugar for 2 – 3 minutes or until fluffy. Add the oil and pumpkin, beating until smooth. 4. Gradually mix in the dry ingredients in 3 batches alternating with milk, starting and ending with the dry ingredients. Don’t over-mix. 5. Pour batter into the pan and smooth the top with an off-set spatula or knife. 6. Stir together the filling ingredients. Carefully pour filling into a piping bag, or use a glass measuring cup with a spout. Swirl the filling onto the top of the cake. 7. Bake for 25 – 30 minutes, or until baked through and a toothpick inserted into the center comes out clean. 8. Whisk together the melted butter and powdered sugar until smooth. (Start with 3 T. of sugar and add the 4th if it seems too runny. Stir in the cinnamon and add milk if needed. You want the glaze to easily spill off the spoon and not be too thick. 9. Drizzle the glaze over the warm cake and serve while warm. Do you love cinnamon rolls, but don’t like to work with yeast dough? I hear this from of lots of my women friends. They love that yeasty flavor and texture of baked breads and sweet rolls, cinnamon buns included, but don’t have the time or knack for working with yeast dough. Well here’s good news….. These are cinnamon rolls made from dough without yeast! In the food processor, no less. So ease of preparation can’t be beat, and the resulting tender sweet, cinnamon rolls are luscious indeed. The inclusion of cottage cheese and non-fat yogurt, plus a small amount of butter guarantees a tender dough. The back story here is that my birthday occurred this past weekend, as it does every year right around Mother’s Day, and having no-one around to bake a cake for me, I made one for myself. Only it wasn’t really a cake. It was these sweet rolls. When they are turned out of the baking pan onto a serving dish, they look like a single layer cake. Frosted with a maple flavor glaze, they are great for breakfast, but we sampled them while still warm from the oven, and had a tiny birthday party just for me. Ha! 1. In the bowl of a food processor, combine the first 5 ingredients. Process briefly until smooth. In a separate bowl whisk together the dry ingredients (flour through salt). Add the flour mixture to the processor bowl. Cover and pulse to form a soft dough. 2. Turn the dough out onto a floured surface and knead 4 to 5 times. It comes together and feels just right. Now with a rolling pin, roll out to a 15″ x 12″ rectangle. Brush the dough with the 2 Tablespoons of melted butter to within 1/2-inch of edges. Sprinkle the cinnamon sugar mixture all over the butter. 3. Preheat oven to 400*F. Lightly spray or grease a 9-inch round baking pan. 4. Starting from the long side, roll up the dough like a jelly roll, keeping it as tight and even as possible. Pinch edges to seal. Cut dough into 1 1/4-inch slices. Lay the slices cut-side down in the prepared pan. 5. Bake at 400*F. for 20 – 25 minutes. Test for doneness with a toothpick. Remove from oven and cool for about 5 minutes in the pan, then invert onto a serving plate. 6. Make the glaze and drizzle over the rolls. Don’t they look fantastic? I dare you not to eat one right now! Yummy cinnamon rolls, still warm from the oven. The cold fall and winter months are not my favorite. But cold weather weekends…..I don’t mind them too much, because I spend a lot of time in my kitchen. There’s something to be said about cooking and baking at this time of year, filling the house with incredible smells and warmth. Here’s the deal with these muffins….they should really be named Pumpkin Apple Cream Cheese Streusel Muffins, which is a mouthful, so I just shortened it. What you need to know about these muffins is –if you don’t like them with, say cream cheese , no problem, skip that part. If you don’t like streusel, no worries, omit it, and move on! Don’t have any apple?, Ok, leave it out. Streusel, yes; cream cheese, no? Totally do-able. Like your muffins naked? Knock yourself out. Do you get the picture here? This is basically a “choose your own muffin adventure”. So let’s get on with it…..
1. Preheat oven to 350*F. Line muffin pans with paper liners, or spray with cooking spray. 2. Prepare dry ingredients by whisking together flour, granulated sugar, pumpkin pie spice, baking soda and salt. 3. In another bowl mix together the eggs, pumpkin and oil. Mix these wet ingredients in with the dry ingredients until incorporated. 4. Stir in chopped apples. 5. Fill muffin cups about 2/3 full. 6. Make the cream cheese mixture– In a mixing bowl of your electric beater, beat cream cheese, sugar, milk and vanilla together until smooth. Place a heaping teaspoon on top of muffin batter in cups. 7. Make streusel–Combine all the dry ingredients, then using a fork or pastry cutter, cut in butter until coarse crumbs form. Sprinkle evenly over all the muffins. 8. Bake for 20 – 25 minutes until a toothpick comes out clean. Cool on a cooling rack. 9. Mix up glaze, if using, and drizzle over tops of muffins. Note: When I made this recipe, I cut all quantities in half, and I still got 11 muffins. My muffin cups were filled to the tops. The only part I omitted was the glaze. These are quite sweet, you could have one as dessert. Awesome! I love it when a recipe has the words “old-fashioned” in its title. There is a certain comfort factor in those words. 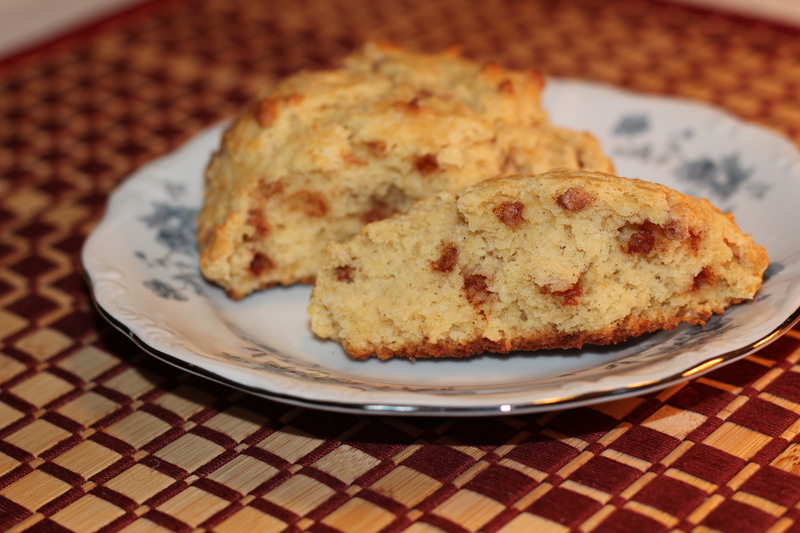 I makes me think of when I was a child and my mother baked something warm and yummy. I particularly loved her coffee cakes that had a crumbly topping with lots of cinnamon and nuts in it. In my mother’s recipe box I have a recipe for sour cream coffee cake, and this recipe today is very similar to that one. The major difference that I can see is that this one uses buttermilk in place of the sour cream. But the soft crumb texture of the cake is just like what I remember. Fresh blueberries are now appearing in the market and I bought some, not really knowing what I would do with them, but then I found this recipe for the coffee cake, so that decided the question. The day I baked it we had to have a piece while it was still warm. Oh my! It was everything you could imagine. The cake has three textural layers; the tender cake, heavily scented by cinnamon, the blueberries oozing their juices, and a crunchy, crumb topping. You had better not skip dessert, if this cake is being served! If blueberries are not available, use any of your favorite fresh or frozen berries. All the layers can be seen in each piece. Prepare the crumb topping: Whisk the flour, sugar, and salt in a medium bowl. Add butter; using your fingertips, work butter into dry ingredients until large, moist crumbs begin to form. Stir in chopped nuts. Set topping aside. Prepare the cake: Preheat oven to 350*F. Coat an 8-inch square pan with nonstick spray. Set aside. 1. Whisk flour, cornmeal, baking powder, baking soda and salt in a medium bowl; set aside. 2. With an electric mixer on medium speed, beat 3/4 cup sugar and butter in a medium bowl until light and fluffy, 3 – 4 minutes. Beat in vanilla. Add eggs one at a time, beating to blend between additions and occasionally scraping down sides of bowl, until mixture is pale and fluffy, 3 – 4 minutes longer. Half the batter covered by a layer of cinnamon sugar. Spoon remaining batter over, smooth top. Remaining batter goes on top. 4. Toss blueberries with panko in a small bowl; scatter evenly over batter. Spread blueberries evenly on top. Sprinkle crumb topping over blueberries. Crumb topping makes the top layer. 5. Bake cake until top is golden brown and a tester inserted into the center comes out clean, 55 -65 minutes. Let cool completely in pan. Store air-tight at room temperature. You know how, when you eat a potato chip, one is never enough? 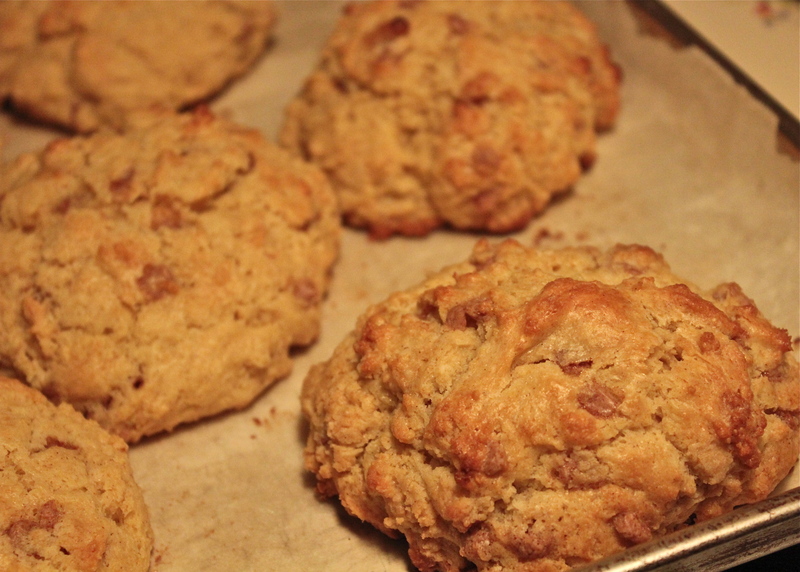 Like that certain brand of chips that claim ” you can’t eat just one.” Well, these scones are like that. Rich with butter, they are studded with sweet, spicy cinnamon chips. If you would like to enrich them even further you may add chopped nuts. Spicy, cinnamon chips scattered throughout. 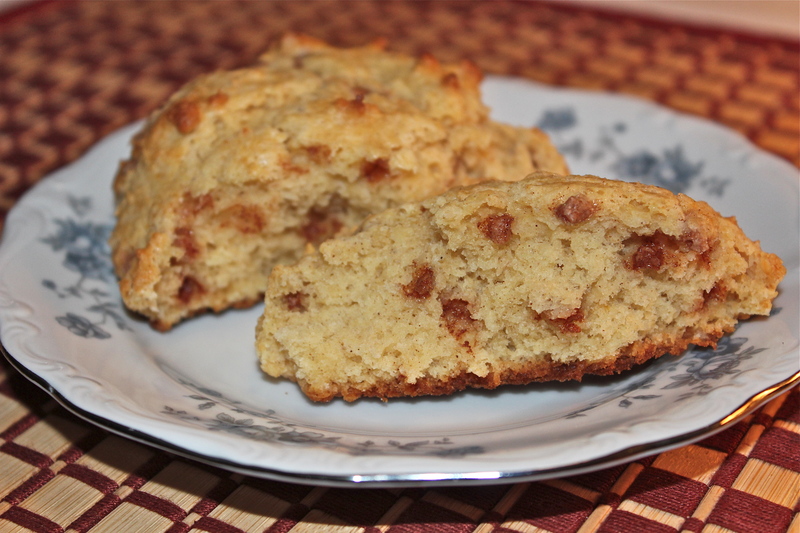 We love these scones, and being a cinnamon lover, I like to add some ground cinnamon to the dry ingredients. Also I keep buttermilk powder in the house, so when a recipe like this one calls for buttermilk, I just measure out the correct amount of dry powder and add water to equal the amount of buttermilk needed. Scones are always best eaten while they are still warm, and these are no exception. Of course two people probably are not going to eat eight scones while they are still warm, so to get that same warmth, just zap one quickly on medium heat in the microwave. That’s what we do for a quick breakfast with coffee. Frequently I will make scones while I’m making dinner, so we have one for dessert while it is warm, and then the rest are ready to be reheated as needed for breakfast(s). 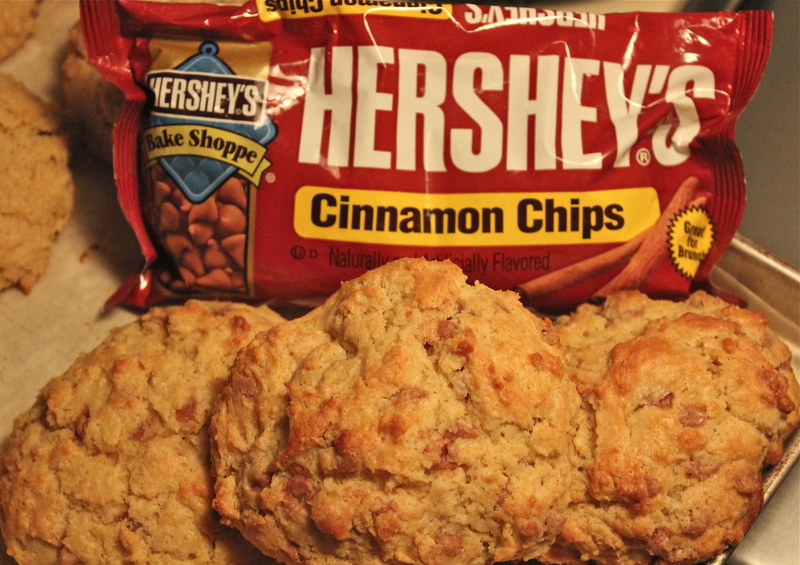 You will find many uses for these packaged cinnamon chips. 1. In a medium mixing bowl, whisk together the flour, baking powder, salt, cinnamon and sugar. 2. Cut in butter with pastry blender until mixture resembles coarse crumbs, with a few chunks of butter still visible. 3. In a separate bowl, whisk together buttermilk, egg and vanilla. Pour the wet ingredients over the dry ingredients, and stir to combine. Stir in cinnamon chips and nuts, if using. Do not over mix the dough. 4. Scrape the dough out onto a lightly floured work surface and knead it gently just until it holds together.. At this point you may pat it into a circle about 8 inches in diameter, cut into 8 triangles, and transfer to baking sheet; or you can scoop up about 1/3 cup dough, and place on parchment lined baking sheet for a “drop-style” scone. That is how I made the ones pictured here. Crispy edges, soft and tender inside. 5. Bake in a preheated 400*F oven for 12 – 14 minutes, until they’re golden brown. Remove from the oven and serve warm. These deliver on their promise. What’s better than cinnamon when it’s warm! 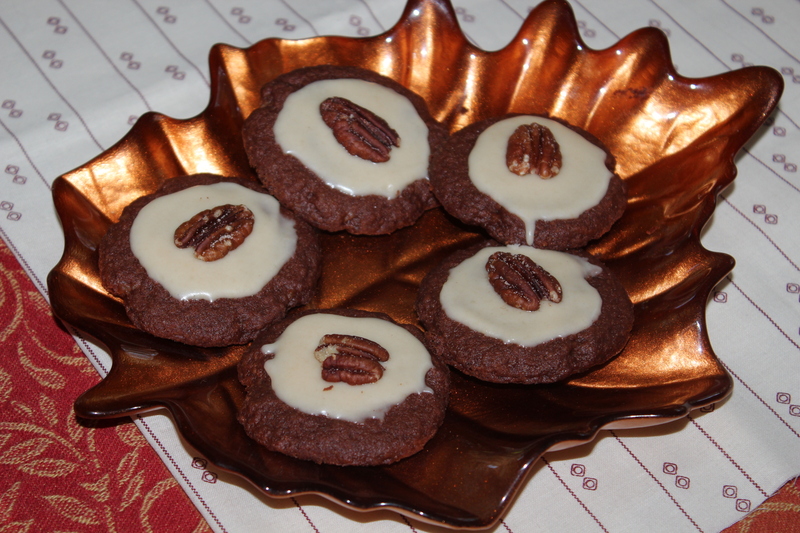 Chocolate shortbread cookies with a little “kick” to them—-Oh, my! 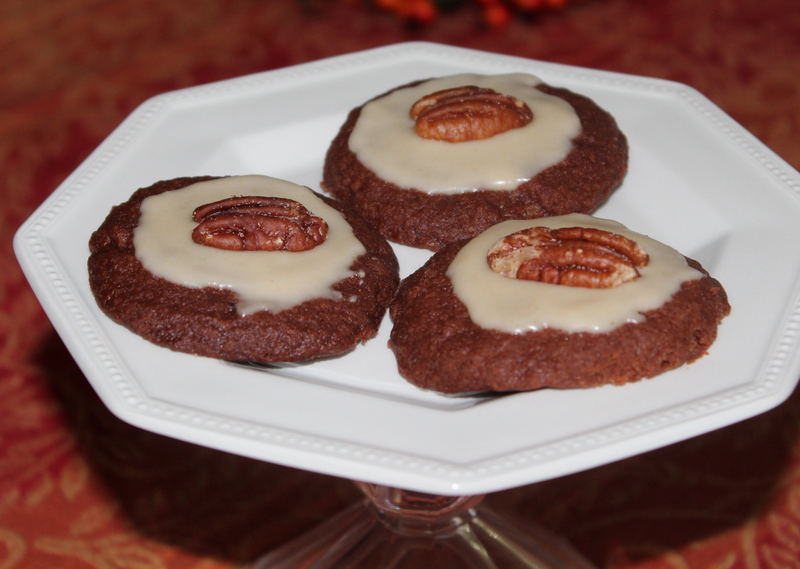 The combination of chocolate, cinnamon and chile peppers is unbelievable; and the buttery, tender cookies just melt in your mouth. Really they do! The recipe has been making the rounds in my neighborhood since one person brought them to our July 4th celebration, and everyone wanted the recipe. 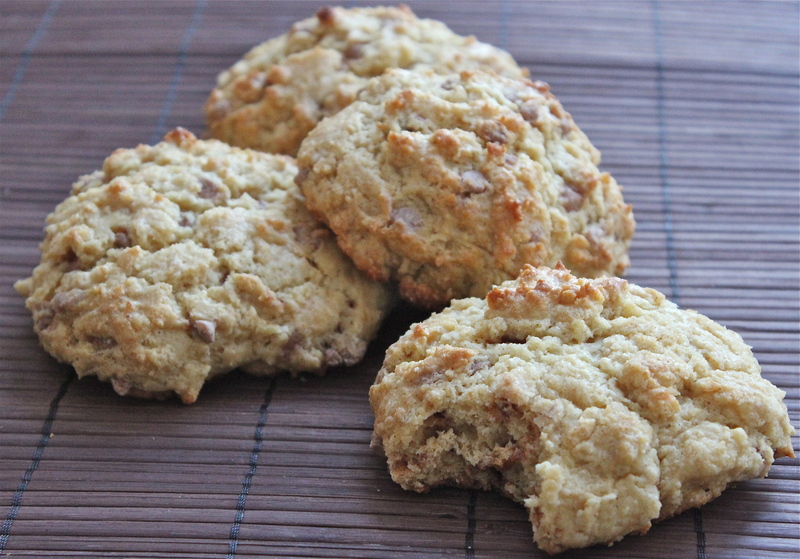 They are that good!…I’ve made them twice since then and I expect I’ll be making them again for the Holidays. 1. Preheat oven to 325 degrees. Baking sheets, un- greased, or parchment lined. 2. Weigh or measure flour. Combine flour, cocoa and next 4 ingredients (through ancho chile powder) in a bowl; Stir with a whisk to blend. 3. Place 1/2 cup butter in a large mixer bowl; beat at medium speed until light and fluffy. Gradually add oil; Beat about 3 minutes till well blended. Gradually add 3/4 cup powdered sugar, beat well. Add flour mixture; beat at low speed till well blended. Cover and chill for at least an hour. This dough becomes quite soft as you mix it and needs to be well chilled before continuing. I chilled mine overnight. 4. Shape dough into 36 balls. Place 2-inches apart on ungreased cookie sheets. 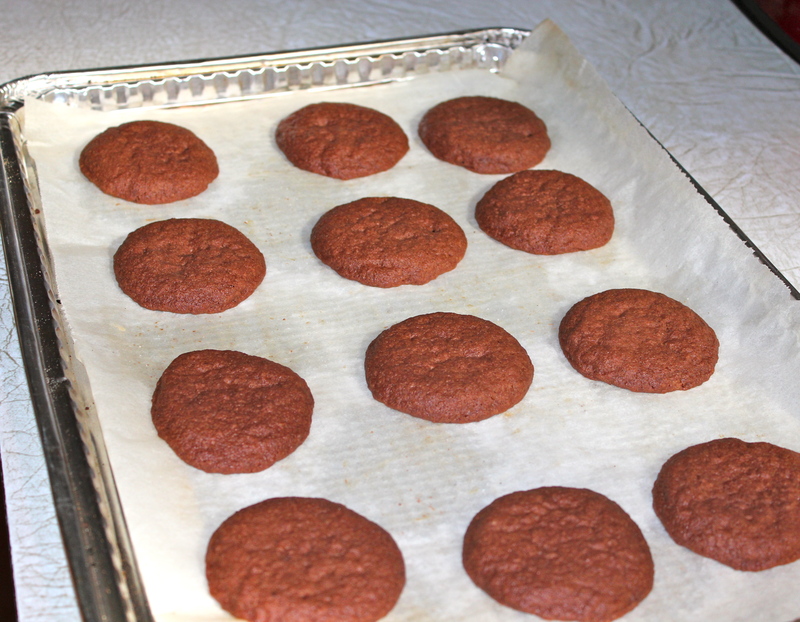 Flatten cookies to 1/4-inch thickness. 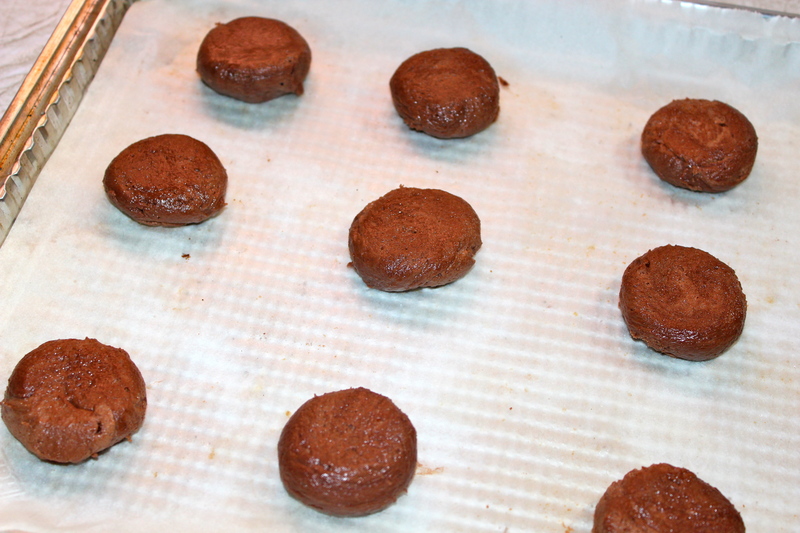 Keep formed cookies on a baking sheet in the refrigerator prior to baking so they don’t spread too much in the oven. Bake at 325 degrees for 18-20 minutes. Cool 1 minute on baking sheet, then remove to wire rack to cool completely. 5. To prepare icing, melt 2 tablespoons butter in a large saucepan over medium heat. Add 1/2 cup brown sugar and milk; This mixture will look curdled. Cook 1 minute or until sugar dissolves, stirring constantly. Bring to a boil; reduce heat, and simmer 3 minutes or until slightly thickened, stirring constantly. Remove from heat; cool to room temperature. Add powdered sugar and vanilla, stirring with a whisk until smooth. 6. To prepare nuts, combine 1 teaspoon brown sugar, sea salt and 1 teaspoon butter in a medium bowl. 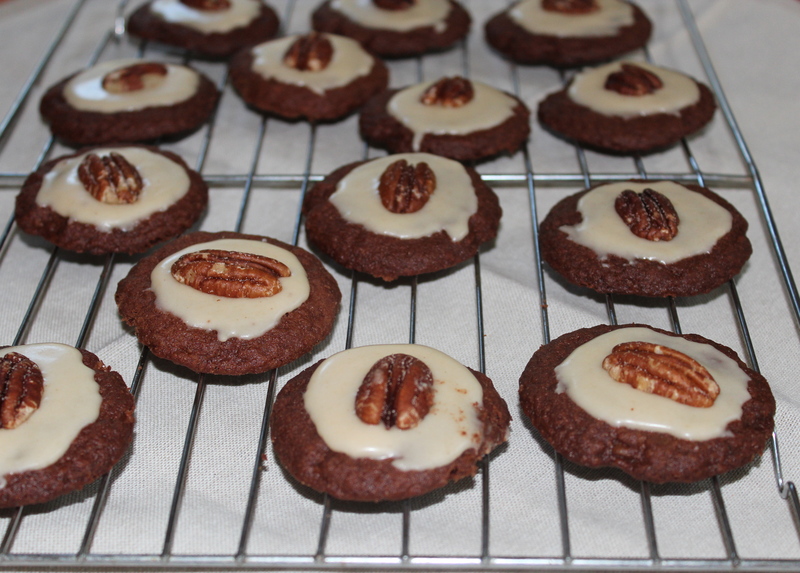 Arrange pecans on a baking sheet. Bake at 325 for 10 minutes or until toasted. Add hot pecans to butter mixture, tossing well to coat. Cool. 7. 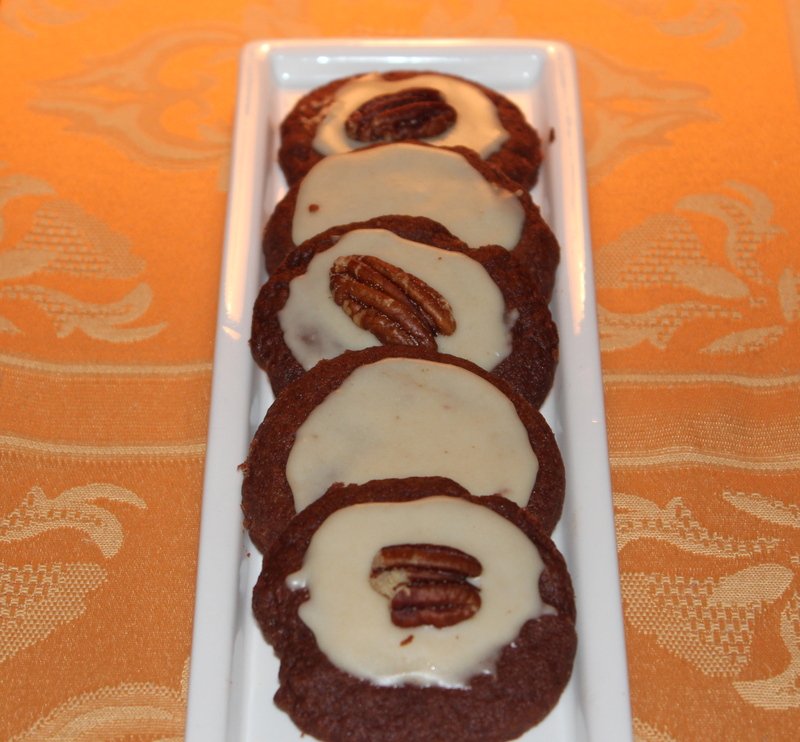 Spread 1 teaspoon icing over each cookie; top each with 1 pecan half.